Everyone has a “Top 5.” But Brad and Matt, along with fellow dorks, Darren, Lisa, and Bryan, choose to walk a different path, and amended that to “A Fistful…” with their blog and podcast, In the Mouth of Dorkness. Topics range from “Heroic Kids” to “Spies” to “Summer Movies” to “Punches” to all things in between. Always fun, often insightful, and something I have regularly pilfered for Warrior27. As they say: If you’re going to steal, steal from those you know relatively well, who will not sue you. 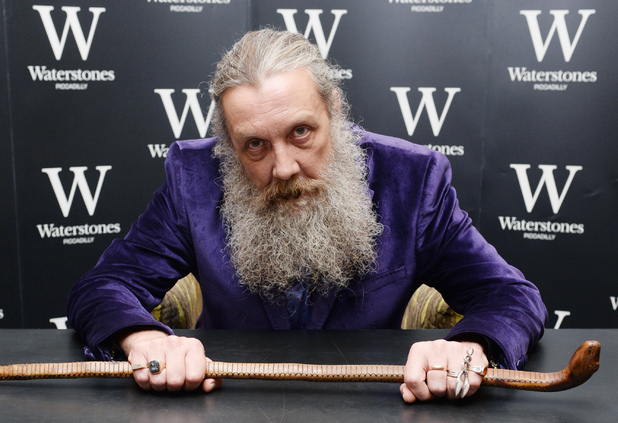 Alan Moore is lauded as the greatest writer ever to work in the comic book medium. Known for his use of literary techniques, such as foreshadowing and symbolism, meticulous plotting, and a facility of language rarely matched by other writers, regardless of medium, Moore is best-known as the author—in collaboration with a host of phenomenal artistic talents—of such books as V for Vendetta, Watchmen, Saga of the Swamp Thing, League of Extraordinary Gentlemen, Halo Jones, Tom Strong, Promethea, Lost Girls, and From Hell. But he’s also crafted many stories that have not received as much attention as these hallmarks. 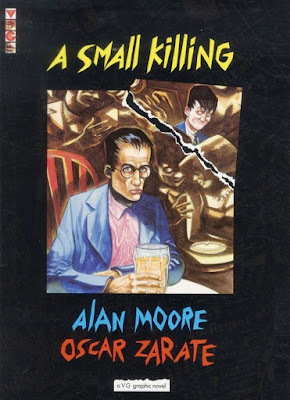 Here, for your consideration, are a fistful of lesser-known Alan Moore comics that you may wish to check out, in no particular order. Because, generally speaking, if Moore is involved, they’re going to be good, and most likely will end up being great…but I may be biased. 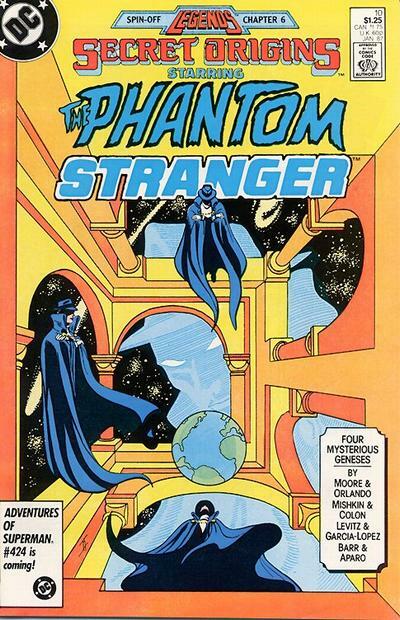 In “Footsteps,” Moore, along with artist Joe Orlando, share one of four origin stories of the Phantom Stranger. In 10 pages, Moore and Orlando relate the story of an angel who was called to join the rebellion of Lucifer. But this unnamed angel found it difficult to decide upon which side he should ally himself, uncertain of the righteousness of Lucifer, while also wavering as to the great Yahweh’s leadership. But deep down, it is his fear of choosing wrongly that drives this angel. And, in the end, he fails to choose either side, leading to exile from both the worlds of Heaven and of Hell. Owing to this, he must walk alone, traveling the Earth, doing what he can to right wrongs and succor the oppressed—a Phantom Stranger, there for those in need. Moore & Orlando interweave this narrative with a complementary tale of a present-day gang member being courted by one among their ranks who wishes to overthrow their leader. In the end, this young man (or, boy, really) fails to choose sides. When he tries to find allies with the rebels—who were handily thrown out of the gang by the leader and his loyalists—he is greeted with scorn, subjected to pain. Thankfully, the Phantom Stranger is there, at the end, offering his hand, as well as his very personal understanding for what this young man now faces. Moore, along with Peter Bagge, tell the life story of the Kool-Aid Man, who was just a little different than the rest of his family. Thank goodness his father finally drew a face on his glass-jar head, otherwise who knows what might have been. Over the course of just 4 pages, Moore & Bagge reveal how being misunderstood by his family leads to the Kool-Aid Man’s life as a struggling writer and his experiments with the counter-culture scene, where he met the likes of Ken Kesey, Tom Wolfe, and Hunter S. Thompson. His off-color activities lead to a breach of contract suit put forth by the soft drink company employing him, which only makes things worse for the Kool-Aid Man. Bagge’s overly cartoonish style works perfectly for this satire. His characters all look as if they walked out of a distorted funhouse mirror, and within this milieu—which is all Bagge—Kool-Aid Man fits in perfectly. It’s a tragicomedy, full of the trademark wit and sly humor expected from the likes of Moore and Bagge, which feels like a far longer tale than the four pages given over to it. Another surprising treat for any Moore aficionados. When Fantagraphics was in the middle of a costly litigation, in the mid-1980s, they produced a benefit comic book, titled Anything Goes!, which they sold to offset legal costs. A who’s who of comic talent contributed to this series, and in issue #2, Moore teamed with Don Simpson for “In Pictopia.” Originally an 8-page script, Simpson expanded it to 13 pages and it’s one of the best things Moore has ever collaborated on. Through this baker’s dozen of pages we follow Nocturno the Necromancer as he makes his way through the city of Pictopia, home to all the comic characters (both comic book and comic strip characters) you’ve ever known (even if they go unnamed, due to copyright). We see the slums, where “funny animals” live and allow people to beat them for fun (since they regenerate afterwards), in order to make money. In the bars are the superheroic types, including characters like the Phantom and Popeye. And an analogue of Dagwood’s bride, Blondie, is seen, very early, taking an old sailor up to her apartment, forced to prostitute herself out for money, now that the popularity of her classic comic strip is no longer in vogue. In the end, Nocturno’s old friend, Flexible Flynn (a Plastic Man analogue), is rejuvenated (or rebooted) into a muscular, testosterone-laden caricature of the character he once was, sending Nocturno into the streets, in search of some kind of solace, only to find that the funny animal slums have been bulldozed. This short story benefits, tremendously, from Simpson’s art. Known mainly—or, mainly to me, at least—as a comedy cartoonist, from his work on Megaton Man. “In Pictopia” reveals his versatility. Adept in multiple styles, Simpson not only delineates the funny animals in a manner reminiscent of those classic comic strips, particularly Disney comics, but he also masterfully creates superheroes in the mode of Marvel and DC Comics of the 1980s, with muscle-laden supermen and lithe, curvaceous superwomen. His ability to skillfully work within these varied styles is what sells this story, and makes it as lasting and important a comic as it is. For Moore’s part—this is as smartly written a critique of the comic medium as you will find, and it’s all told through the very same medium it critiques. 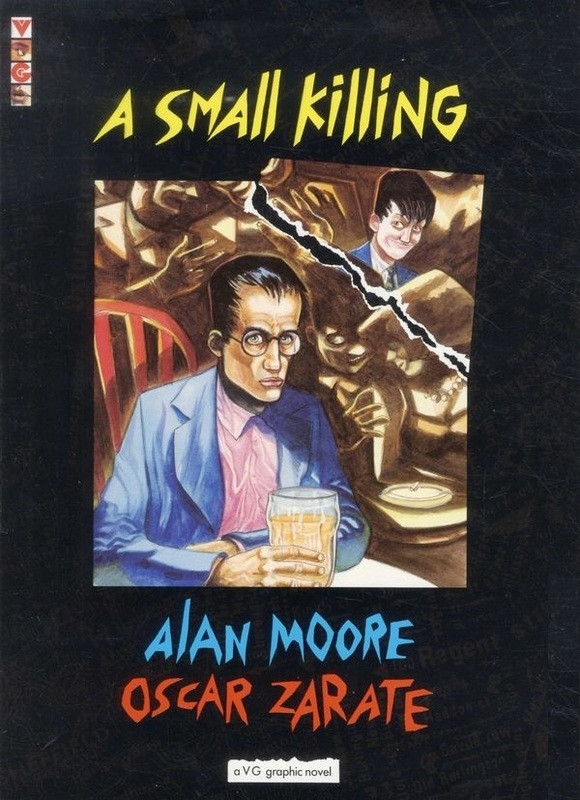 As with any Moore-penned tale, the dialogue and descriptions roll smoothly across your tongue, while both entertaining and enlightening readers—in this instance, providing a visual metaphor of how the “grim & gritty” approach, fostered by simplistic, surface readings of the comic work of Moore (particularly Watchmen) and Frank Miller, led to a more violent and more “relevant” storytelling approach in comics, which lacked the characterization and depth of narrative these two creators and their collaborators were aspiring to. Certainly, one might see some of the metaphor as lacking in nuance, but maybe that was what was called for, because nobody (or very few) artists and writers seemed to get the message. 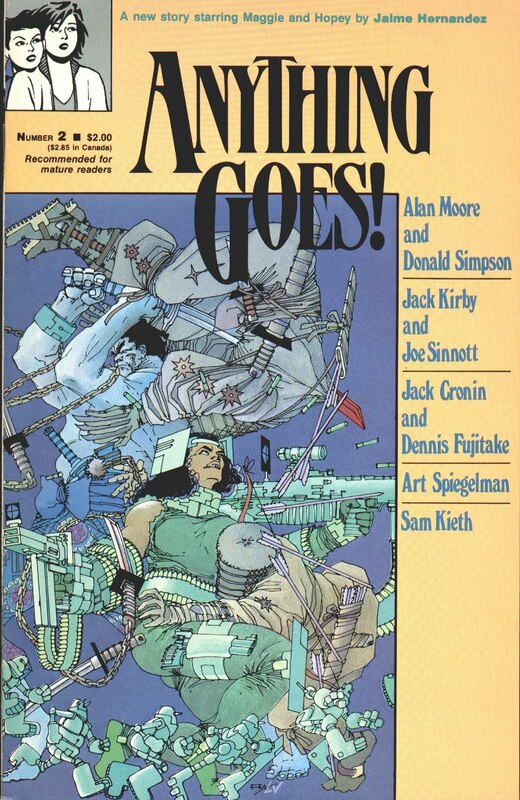 Alan Moore & Bill Sienkiewicz—two legends of the comic book industry. 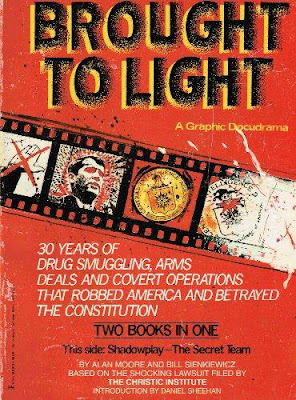 With Shadowplay, Moore & Sienkiewicz relate the thirty year war the CIA has perpetrated upon the United States Constitution, through its machinations across the globe. Utilizing a lawsuit brought by the Christic Institute, along with other primary sources, these two artists distill into 32 pages the drug smuggling, assassinations, coups, double dealings, and myriad other illegal activities the CIA have condoned and enacted, from the 1950s to then-present 1988, in order to steer international sociopolitical actions, while expanding their power across the globe. It is a terrifying and overwhelming narrative, one that feels ripped from a bad spy thriller. And yet, for all that, it also feels far too real. Moore & Sienkiewicz choose to tell their narrative through the eyes of America (the real America, the strong America, not the whiny, liberal, Commie-loving pansies who would constrict our nation’s influence abroad), in the embodiment of a bald eagle who enjoys Cuban cigars, hard liquor, and loose women. The narrative is told as if you, the reader, just stumbled into a bar and found the Eagle already going on to the barman, as he enjoys his whiskey. Seeing you, the Eagle starts to spill his guts, going on about all the CIA has done to achieve its foothold on the international scene, much of it done behind a curtain of secrecy. We learn of people such as Oliver North and Richard Secord, and of the CIA involvement in the Vietnam War and the Iran-Contra affair. It’s chilling, thanks in no small part to the subject matter, a feeling that is heightened by the artistry of Sienkiewicz, whose mastery of staging, cartooning, and symbolism wonderfully complement Moore’s writing. This is a must-read, especially now. And, if you prefer something less visual and can find it, Moore produced a spoken word CD, with musician Gary Lloyd, of this same story, and his thick, melancholic voice only accentuates the horror revealed within this narrative. It’s 1989, and Timothy Hole (pronounced “holly”) is on the cusp of a career-changing, and possibly career-defining, enterprise. He is to create the advertising campaign for Flite, an American soda, as they introduce their product to a newly opened Russia. But Hole is awash with anxiety, unsure of how to approach this new challenge, unsure if he really wants this assignment, unsure of how his life has brought him to this place, so far away from what his aspirations once were. And, even as his mind races with questions, Hole spies a young boy in the crowded streets of New York City who unnerves him. The next morning Hole embarks on a jet for England, a layover to visit his parents before continuing to Russia. He spends a short time in London before moving on to Sheffield, where his parents live, which leads him to visiting the “Old Buildings” where he grew up. All the while, the strange boy follows Hole, flitting among crowds and down alleys while the older man pursues him—a futile enterprise. As Hole moves backward through his life—through the places he’s lived—he revisits, in his mind, the most important aspects of his life in those places: his marriage, the subsequent divorce, a contentious break-up with the woman who followed, and a childhood memory of burying insects alive, the guilt of that act having trailed him ever since. In the end, Hole is forced to come to grips with the life he has lived, how far short he fell of his youthful ideals, and how culpable he is for all the failings and faults that have overshadowed this life. In the end, Hole must make a decision, come to grips with his life, and find a way to move forward. Zarate’s artwork in this book is just beautiful. He has a loose style that borders on caricature without falling too heavily into that mode, with a sense of color and shading that highlights pertinent aspects of a panel while imbuing the whole narrative with a lushness found in too few comics. The coloring seems to be achieved through watercolors, allowing for a wider range of hues. I’m unsure if it’s actually paint on the boards or a different technique, but the results are masterful. Most of all, though, I love how distinct Zarate’s art style is. It could not be mistaken for anyone else’s, and that makes all the difference in this, one of Moore’s most literary collaborations. There are plenty more lesser-known works from the Wizard of Northampton, including stories about Batman’s rogue, Clayface, DC characters Vigilante and Omega Men, Marvel’s Captain Britain, Image titles WildC.A.T.S and Spawn, as well as work with Dame Darcy and his collaboration with Ian Gibson, Halo Jones. Any of these would sit well on this list. What ones would you include?